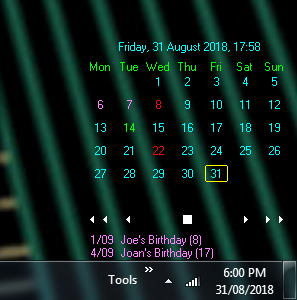 A small calendar and event reminder that unobtrusively sits on your desktop and is ready to use any time. No task bar button or system tray icon. The calendar is transparent so it’s not an eyesore and consumes very little memory. Enter as many daily or regular reminders as you like. Float your mouse over a day to see all reminders for the day. Shows a short list of upcoming reminders below the calendar. Fonts, colours and tool tips are customisable so it blends in with your desktop colour and font schemes. You can leave bug reports and ideas in the comments below. If you have a translated language file you think could be useful to others, send it to me and I’ll include it in the next release. If you have any cool WMI entries that we can use let me know in the comments below. Thank you to everyone who has donated something thus far. If you haven’t donated yet please consider $5 to $10 to show your appreciation and to help keep the project alive, maybe even an ongoing monthly donation. You can use PayPal, your debit or credit card.